As reported by Breitbart on Mar. 3, 2019, Greenpeace co-founder Patrick Moore slammed Alexandria Ocasio-Cortez "AOC" and the Green New Deal in a series of tweets calling out the deadly consequences of green ideology, says Friends of Science Society. Moore was blunt – tweeting “@AOC .... You don’t have a plan to grow food for 8 billion people without fossil fuels, or get food into the cities. Horses? If fossil fuels were banned every tree in the world would be cut down for fuel for cooking and heating. You would bring about mass death.” Ocasio-Cortez is a Democrat and Member of the U.S. House of Representatives from New York's 14th congressional district. This view is echoed by earlier work of Prof. Michael J. Kelly of Cambridge. In a 2010 power point he warned that rapid decarbonization would cause mass deaths; renewables are not up to the job. That view is disputed by a report issued the same day from the Global Warming Policy Foundation, written by Ottawa energy economist Robert Lyman, entitled “Transition to Reality.” Lyman ‘does the math’ and calls for the political classes to stop making claims that they cannot fulfill and to return to energy policies grounded in reality. “To show that rapid decarbonization is possible, you have to show that the technologies work at scale, that they are reliable and affordable and don’t damage the environment, and that they can be deployed on the timescales envisaged. Advocates of renewables simply don’t even try to do this”, writes Lyman. On Nov. 28, 2018, Friends of Science Society issued an Open Letter to the IPCC denouncing the IPCC SR15 report. They say the report advocates for crimes against humanity in the form of massive biofuel operations and would have deadly consequences to society from rapid decarbonization. Friends of Science Society says open, civil debate on these matters is crucial. 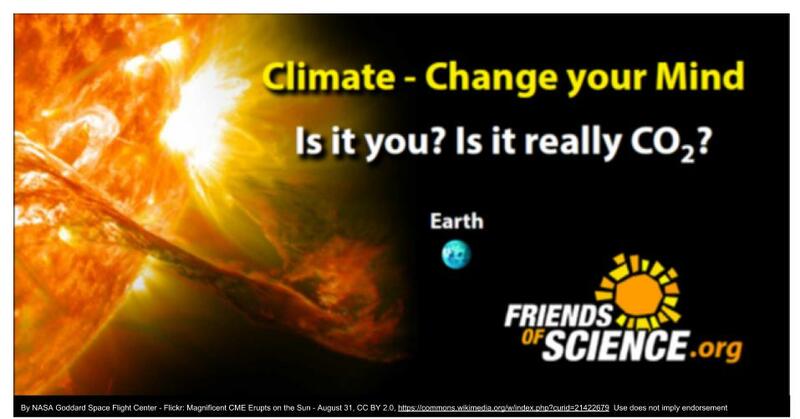 A reminder that Friends of Science will host Dr. Susan Crockford and Dr. Willie Soon at their April 10th event in Calgary entitled "Polar Bears and Solar Flares."